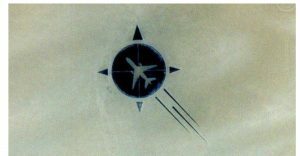 On 19 September 1989 UTA flight 772 (Brazzaville in the Republic of Congo to Paris) was blown up over the Sahara desert. All 156 passengers and 14 crew members were killed. The association of the victims’ families, Les Familles de l’Attentat du DC-10 d’UTA, put up a memorial 10 km away from where the plane crashed at 16°51′53.748″N 11°57′13.362″. Guillaume Denoix de Saint Marc, who lost his father Jean-Henri in the DC10 crash, was behind an eighteen year effort to create the memorial. The monument is constructed of black rock in the shape a DC10 airplane inside a compass, with one of the plane’s wings used as a compass point, and over 170 broken mirrors representing the victims of the crash.